Travel delights and fascinates so many people, while sometimes I wonder what would happen if we were forced to stay in the same area all our lives and make do with what we could find locally, for the most part. Human beings are limited to the planet naturally, but we seem to have little idea however of the fragile nature of this environment. If we were limited to a smaller area perhaps we'd be more careful? Some of us have wasted, (arguably) trillions of dollars on trying to find other planets with life or where we could live, instead of managing ideas and inventions so we live more creatively, safely and economically on this one, Earth. Those notions appeared in my mind after regarding that poster above. 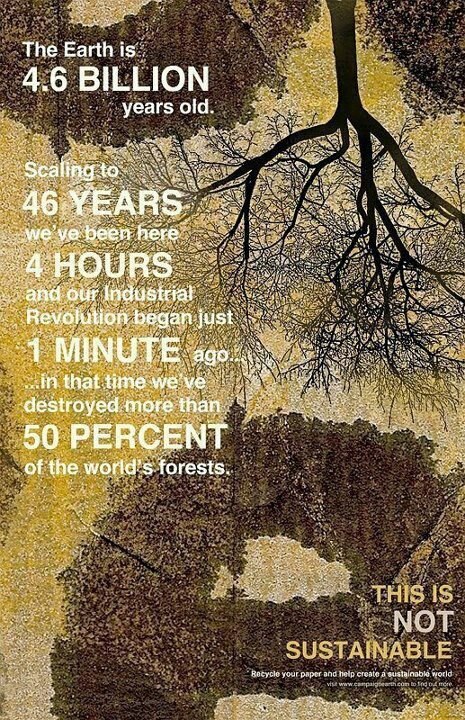 We all need to plant more trees. The simplicity of that idea could put some people off, they like more glamour, more persuasion and definitely more of someone else's involvement, not them having to do something, no, no no. Such people weary me. Still, til the day I die I shall keep on propagating trees from seed and giving them away or selling them for very little and tending the rather lush rampant greenery of this property. The joy of a garden is in how it changes and the pleasure of simply being outside in the growing of the place, birds, butterflies, flowers, vegetables, trees, the occasional visiting cat and always a sense of something happening. A garden may not make many sudden movements but it is never entirely still. People who have an apartment or are unable to manage a garden themselves could start a community garden, work in one occasionally, or become an activist to call for others to contribute more to a sustainable world. We need to manage the resources we have now to make them last, to keep regenerating and stay healthy. Various links are below to sites which assist with these eco-sound ideas and more, such as monetary issues. I find myself rather worn down lately with the bleak winter weather here in New Zealand and also, a return to my other writing work which is emotionally demanding, then the isolation gets to me and I feel rather glum. This blog is therefore not as newsy or animated as it perhaps was when I travelled the Pacific and Am er i ca, but I shall keep on providing information about friendship, travel and trees herein. The first video at least on this blog link below could be watched, it really clearly explains how money works and how we could change things to make the system work better for most instead of few, becomes clearer. This link regards privatisation and easily explains the issues. These are places to buy trees in countries where they are needed, so they are planted to make up for your carbon emissions. Please do your own research to find out what others think of these companies.